When Jewdar and Missus Jewdar, go to the fancy movie theater, we’re always mystified by how boring the movies in the trailers look. Sometimes, we’re right. Sometimes, though, the fancy movies come through. 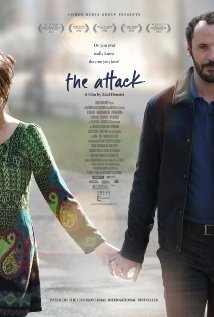 Case in point—The Attack, the new film out this week by Ziad Doueiri, based on the novel of the same name by Yasmina Khadra (pen name of Algerian author Mohammed Moulessehoul). The movie begins with Dr. Amin Jafaari receiving a prestigious medical award. A West Bank-born surgeon who got a scholarship to an Israeli university, got Israeli citizenship and a job in an Israeli hospital, and is living with his wife in a comfortable Tel-Aviv suburb with Jewish friends and colleagues. In receiving his award, he speaks of the questions he receives on how he can live in Israeli society. His answer expresses both optimism and a reality that Israel isn’t quite there yet. It’s a question, and an answer, that frame and inform a well-paced, balanced, and compelling movie. The next day Amin is on duty at the hospital when a bomb goes off, and he has to treat the victims of a suicide bombing, which, within a day, is literally laid at his doorstep when the authorities identify his wife as the bomber. The rest of the movie involves Amin’s efforts to come to grips with the accusations, the evidence, and his relationship, both with Israeli society, and the family and national identity he left behind in Nablus. Jewdar is not a big fan of spoilers, and there will be none. Suffice it to say, though, that the movie takes a remarkably even-handed approach to the Israeli-Palestinian conflict, and we see real human beings, with real concerns, on both sides (it is sufficiently even handed that, according to the Beirut-born Doueiri, the Arab League has called for a boycott on the grounds that it insufficiently demonizes Israelis). To a great extent, though, the movie is less about the conflict, than about a web of complex relationships, and one man’s efforts to understand his place in their midst. And if some questions remain unanswered, well, you can’ t really blame Doueiri (who co-wrote the screenplay with his wife) for not being able to resolve them any better than the Israelis and Palestinians themselves.